Dinosaur Wars: Deadly Dinosaurs Go Head to Head by Phil Manning & Peter Minister. An Animal Wars Book. Review: Imagine if you were able to see dinosaurs go head to head! Seeing the offender biting into the neck of a helpless dinosaur and seeing the defender fighting back to save himself from death would be exhilarating. If you love these types of books, then Dinosaur Wars is the perfect book for you! Written by Dr. Phil Manning and illustrated by Peter Minister, Dinosaur Wars is perfect for all the dinosaur lovers of the world! Dinosaur Wars includes mini stories of a battle between two dinosaurs that pop up in the middle of interesting facts about the dinosaurs that battle in the book. First comes the battle, then the information, then another battle, and then more information and so on. There are stories like a Megalosaurus keeping a Camptoaurus cornered with an injury on its back, huddling to the wall of rocks, trying to escape. Or like when a Protoceratops loses her young to a duo of Velociraptors! At the back are the results of the fights! Amazing stories! But deadly attacks! Dinosaur Wars is an amazing guide for kids around the ages of 6 and up or even an amazing way to keep the young ones entertained with the awesomeness of dinosaurs! 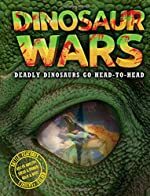 In Dinosaur Wars, kids are happy while they are learning about Dinosaurs or just reading about everyone's favorite giant lizards, fighting each other! Boys are positively going to love this book! Also girls with these types of interests will find this fascinating! Dr. Phil Manning and Peter Minister's Dinosaur Wars is an amazing book that everyone should know about! We would like to thank Ticktock for providing a copy of Dinosaur Wars: Deadly Dinosaurs Go Head to Head for this review. Have you read Dinosaur Wars: Deadly Dinosaurs Go Head to Head? How would you rate it?